Kate pointed out an article in the January issue of Smithsonian magazine about Wilson Alwyn "Snowflake" Bentley. He was a Vermont farm boy who got to fiddling around with a view camera and microscope in the 1880s so that he could make images of snowflakes — or more accurately, the ice crystals that make up the flakes. And that, to fit a lifetime into a sentence, is how we know that no two snowflakes are exactly alike. Having never heard this guy’s name before, what’s a little surprising is how well known a figure he is and how much information about him is floating around. 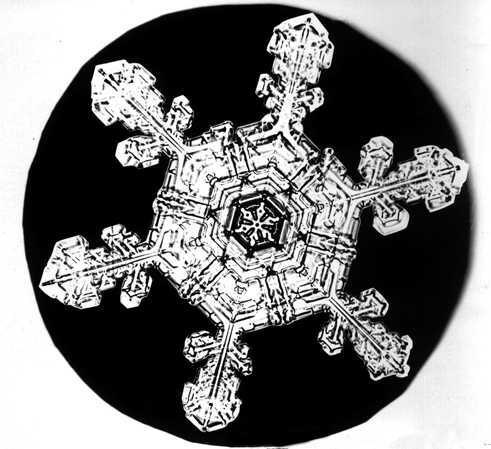 The historical society in his hometown, Jericho, Vermont, has a Snowflake Bentley site dedicated to his work (with a small but dazzling gallery of some of the original images. Dover has republished the book Bentley published just before he died in 1931, "Snow Crystals." Since Bentley was curious about other precipitation phenomena — he spent several summers taking pictures of raindrop impacts — weather scientists eventually discovered his work and celebrated it, and one has written a biography, "The Snowflake Man: A Biography of Wilson A. Bentley." There’s a critically well-received children’s book about him.